10,188 steps total. That is seven days in a row. The opportunity to do that led me to walk around and reach the goal. Bilbo, Gandalf and the dwarves are being rescued from the wargs and goblins by the eagles. That’s the number of steps today. The most steps on this current adventure. They came from 2.32 miles on the treadmill, a walk around the snowy downtown Nashville streets, several trips from the room to APCE Marketplace, and some walking around the parking garage as the load in began. By that point it had become clear that a new record could be set! Listening to The Hobbit continues. Bilbo, Gandalf, and the dwarves have made it to Rivendell. By the way, the step total for January is over 260,000! I am not attending the meeting of the Association of Presbyterian Church Educators. I am hanging out with Tricia – doing some minimal work around the edges – but actually kind of vacationing to some extent. I slept in until 10:30 or so. Then went to the fitness center at the Renaissance Hotel. I did 2.39 miles on the treadmill. The afternoon saw the continuation of the quest to visit National Parks. I drove to Murfreesboro to visit Stones River National Battlefield. On December 31, 1862 and January 2, 1863, forces under the command of Gen. Bragg (CSA) and Gen. Rosecrans (USA) clashed along Stones River. The battle was fought on cotton fields and among cedar timbers and in places remembered after as The Slaughter Pen and Hell’s Half Acre. 3,000 men died; killed, wounded, and missing totaled over 23,000. I go to and come away from such places with mixed emotions: horror, sorrow, pain, pride and more intermingle. The place seems hallowed in ways I can never describe. Walking alone on the boundary trail, every rustling leaf and every squirrel moving on the ground made me feel surrounded by ghosts. The area has been struck by tornadoes in the not too distant past. Trees are torn apart, knocked over, strewn across the parts of the park. I wondered what it looked like when the trees were torn apart, knocked over, and strewn across the ground by cannon and rifle fire. The park contains the nation’s oldest intact Civil War monument. A square column, erected by the survivors of Colonel William B. Hazen’s brigade, stands surrounded by a stone block fence. The dead lie with the comrades of their respective regiments. Outside the fence is the grave are two additional graves – those of Sgt. William Holland and William Harlan. Sgt. Holland served in the U.S. Colored Infantry, not in Hazen’s brigade during the Civil War. He lived until 1909. At that time, the U.S. military was segregated. He was not buried with the others, either around Hazen’s monument or in the National Cemetery across the road. This apparently was by his choice, not a continuation of segregation. The story told by the National Park Service and in an article in the Murfreesboro Post, is that Holland picked his own burial plot – on a small farm he owned next to Hazen’s Monument. William Harlan was his grandson. The Stone River National Cemetery is directly across the road from the battlefield. 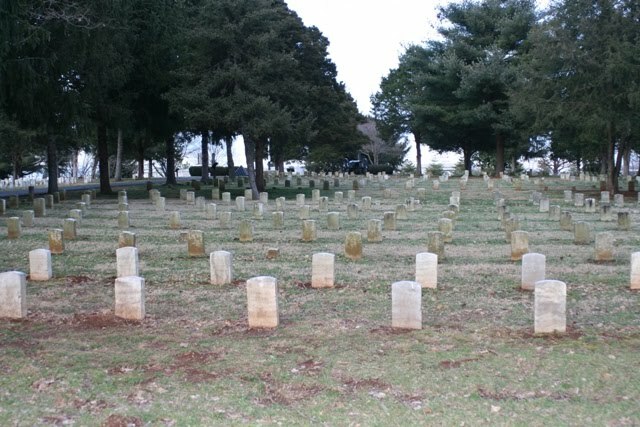 Looking at the rows of white crosses and recalling the number of charges made by Confederates and Federals alike, I imagined the cemetery as the place where the last charge at Stones River took place. It was also striking how many stones bore only initials. Lots to mull. That’s part of the appeal of national parks. Got up and hit the gym. 2.19 miles on the treadmill while listening to The Hobbit. Three trolls have been turned into stone. Drove to Nashville to hang out with Tricia at APCE. Watching Duke with her and a friend. It has been something of a struggle. Duke started well; FSU came back; now Duke is opening a lead again. Once again on the drive, as on the travel to and from the Big Tent, I missed Dinosaur World which is located outside of Cave City, KY and which features over 150 life-size dinosaurs and a new herd of mammoths in Mammoth Gardens. Tomorrow – depending on the weather – Stones River National Battlefield. Weighed in this morning – not as part of the Biggest Loser but simply to see what the last week or more had done. Was pleasantly surprised to find a gain of only 2 pounds. Ate too many pistachios and protein bars. But did get to the gym for 2.08 miles on the treadmill and made 10,906 steps. The movie today at the cardio-theater was The Incredibles. Not a bad movie, but I misread the sign and had anticipated Casino Royale. So I used my iPod and started listening to The Hobbit. Bilbo has now gone to bed after listening to the dwarves talk about their adventure. Bad dreams plague his sleep. This evening I watched Shake Hands with the Devil. It is the story of General Romeo Dallaire who commanded the United Nations forces in Rwanda at the time of the genocide. The forces were badly understaffed and inadequately supplied. They also had a mandate that did not fit the situation. Dallaire was not perfect as a commander. But he did more than virtually anyone else. In a situation where the entire world failed the people of Rwanda – ignored the people of Rwanda – turned away from the people of Rwanda – Dallaire tried. He saved thousands, yet remains forever haunted by the hundreds of thousands he could not save. His command failed. But it was set up for failure. Dallaire continues to wrestle with guilt over the nightmare – guilt that nearly consumed him – guilt that is not shared by those who bear far more responsibility, those who created the conditions for the failure, who carried out the killings, who stood by, who looked away – by the genocidaires, Belgium, the Catholic Church, the UN, the United States, France. Will the world do better in Haiti? I pray so. I also watched Richard III with Laurence Olivier. He too was plagued by bad dreams. Tomorrow (or today since it is well after midnight) I drive to Nashville. May you sleep well. May I sleep well. The final day of this New Mexico trip saw me hanging out in Albuquerque. I overate again. That stops tomorrow. But I could not pass on the food here. I got a hotel that has a fitness center. So I did 2.25 miles on the treadmill. I also went to the Coronado State Monument – not sure what I make of that name. It apparently is near the place where Coronado and his party of invaders wintered in 1540-42. An ancient pueblo there – Kuaua is there. The pueblo was settled about 1300 CE and abandoned toward the end of the 1500s CE. It sits right along the Rio Grande. 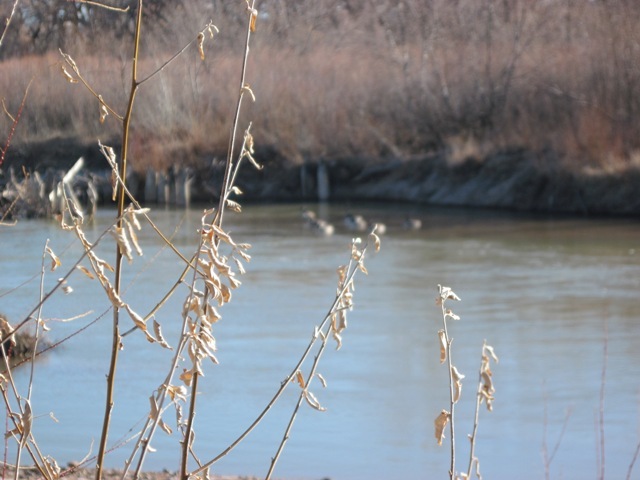 Despite the cold weather (which the wind that picked up during the early morning did not help), I did the trail along the river and the trail around the pueblo. Then I went to the Pueblo Cultural Center. Interestingly enough, it has an exhibit on the saints of the pueblos. All that walking led to a step count of 12,807 – the highest so far! 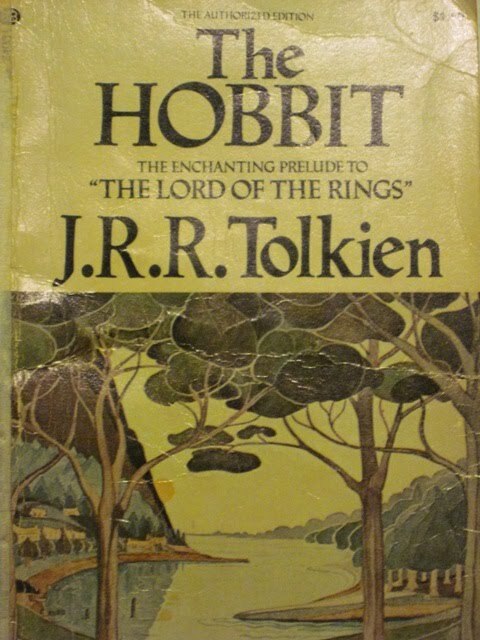 Tomorrow – the return to the Shire. I have overeaten the last couple of days. It is easy to blame that on being in New Mexico and being overly tempted by the food that I love. There is truth to that. But the reality is that I need to be able to face food that I love and eat reasonably. I have not walked 10,000 steps either of the last two days. I did not make 10,000 steps the last two days combined. 6740 today. I helped to lead an all day workshop each day and that just made it too easy not to get out and do the walking. Again the reality is that I need to learn to cope with that. I did not do concentrated walking yesterday. A friend’s comment on yesterday’s blog inspired me to head back to the track today between the end of the workshop and dinner. I went 1.5 miles – not as long as I should have – but all the time allowed. And it is better to have missed only one day. While the overeating included starches (chips and sopapillas), it did not include sugar based products. No flan. No fried ice cream. No chocolate chip cookies served on the breaks. One takes the wins one gets. Football tomorrow. And walking. Travel on Monday – but late enough in the day that I should be able to walk.